Fill large saucepan halfway with water; heat to boiling. Add chicken; cook uncovered 15 to 20 minutes until juice of chicken is clear when center of thickest part is cut (at least 165°F). Remove chicken from water to large bowl; shred with 2 forks. Pour pepper sauce over shredded chicken; toss until completely coated. Set aside. In 12-inch skillet, heat 1 teaspoon of the oil over medium heat. Place 1 tortilla in skillet; on half of tortilla, sprinkle 3 tablespoons mozzarella cheese, 2 tablespoons blue cheese and 1/2 cup shredded chicken. Fold tortilla in half over filling. Cook 3 to 5 minutes, turning once, until golden brown and cheese is melted. Remove quesadilla to plate; cover to keep warm. Repeat with remaining oil, tortillas, cheese and chicken. Cut each quesadilla into 4 wedges. 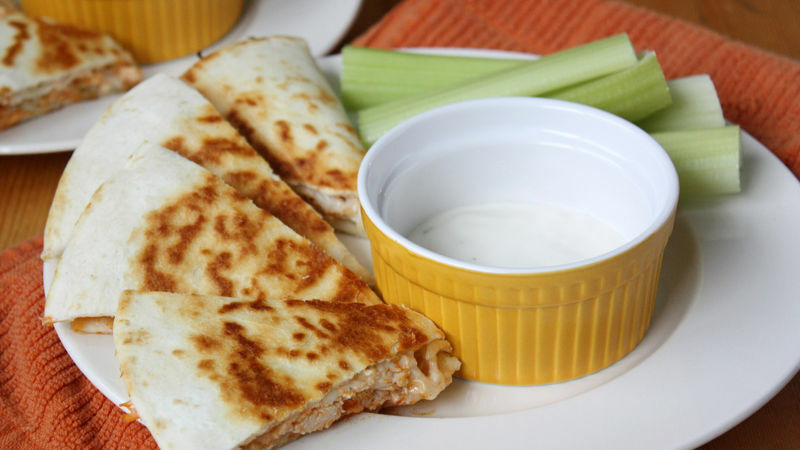 Serve with blue cheese dressing and celery sticks. For added spice and flavor, sprinkle a few dashes of Old El Paso® taco sauce, or extra red pepper sauce, on the tortilla before folding over. For a speedier recipe, shred leftover cooked chicken or purchased rotisserie chicken, or use canned chunk chicken breast in place of the poached chicken.